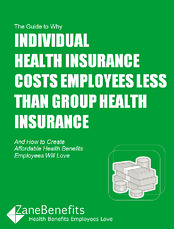 Zane Benefits, the #1 online health benefits solution, announced today the publication of a free eBook "The Guide to Why Individual Health Insurance Costs Employees Less Than Group Health Insurance." The new eBook helps Small Business Owners, HR Managers, and Nonprofits understand the cost advantages of individual health insurance and how to structure health benefits that take advantage of these savings. According to Zane Benefits, individual health insurance costs less than group health insurance for most employees. And as of 2014, there are new advantages to individual health insurance. Because of the affordability of individual health insurance compared with group health insurance, most (if not all) small businesses are offering employee health benefits with a pure defined contribution approach. In fact, experts agree that defined contribution paired with individual health insurance is the future of small business health insurance. The guide is written for Small Business Owners, CEOs, and HR Managers. The guide provides an overview on why individual health insurance costs less, the new advantages of individual health insurance, and how businesses can leverage these advantages to create affordable employee health benefits.